Spectra Group (UK) Ltd is an internationally renowned specialist provider of secure voice, data and satellite communications systems, specifically optimized for use in remote and challenging environments. Following significant interest from the Middle East and Asia, particularly regarding their battle-winning SlingShot tactical communications system, Spectra Group (UK) Ltd will this year be exhibiting at the International Defence Exhibition and Conference, IDEX, for the first time. IDEX is the only international defence exhibition and conference in the Middle East and North African (MENA) region and takes place 17-21 February 2019 at the Abu Dhabi National Exhibition Centre (ADNEC). 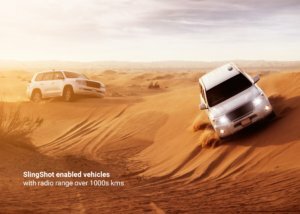 IDEX showcases the latest technology across land, sea and air sectors of defence, providing a strategically important opportunity for Spectra to exhibit their unique SlingShot tactical communications system. Spectra Group (UK) Ltd will be located at stand number 05-C03 in the British Pavilion. Spectra’s SlingShot is a small appliqué that provides in-service tactical VHF and UHF radios with a Beyond Line of Sight Communications on The Move capability (BLOS COTM). In addition to standard voice and data C2, SlingShot can facilitate a wide range of capabilities such as remote biometric analysis, fire mission planning, remote tracking, border security and inter-agency operations. Man-portable or vehicle-borne (land sea and air), useable on the move, delivering flexible channel leasing and with minimal increase in training-burden, SlingShot redefines tactical communication capabilities. Recent world-wide exhibits of SlingShot have been met with substantial international interest. Considerable excitement has been generated over SlingShot’s capability to significantly extend the range of in-service tactical radio systems, without the need for users to buy new radio systems, carry additional bulky equipment or conduct extensive additional training. Spectra will be showcasing the SlingShot tactical communications system on Stand 05-C03 in the British Pavilion.